This Bubble Up Chili Cheese Dog Casserole is a guilt-free guilty pleasure the whole family will love! I know you all love my bubble up casseroles (I have everything from a pizza flavored one, to chicken alfredo, to enchilada to pot pie and more!) and I thought it would be really fun and tasty to make one using the craveable flavors of a chili cheese dog. This casserole has a hearty base of turkey chili with beans along with hot dogs, melted cheddar cheese and the bubbling up of biscuits throughout. My husband ate this for several meals in a row! 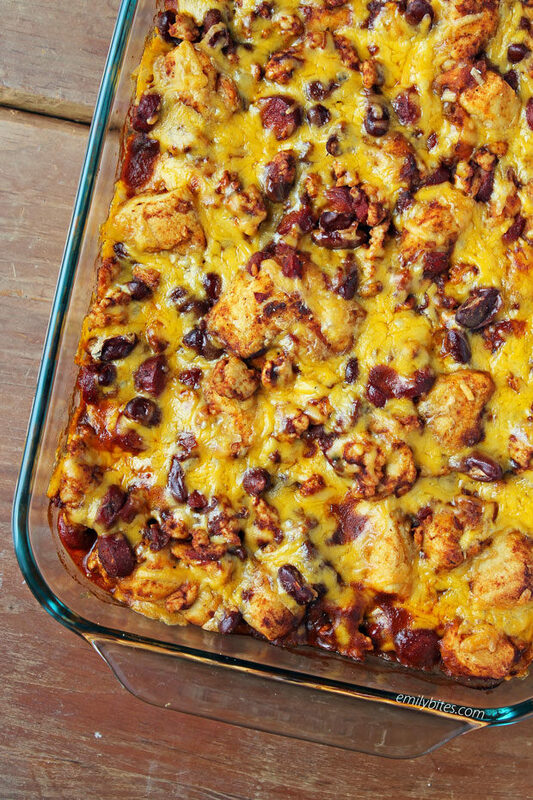 Better still, each serving of this Bubble Up Chili Cheese Dog Casserole is just 321 calories or 5 Weight Watchers Freestyle SmartPoints! Mist a large saute pan with cooking spray and bring to medium heat. Add the ground turkey and use a wooden spoon to break it up into small pieces as it cooks. When the turkey is breaking up and almost browned, add the onions, garlic and hot dog pieces and stir together. Continue to cook another few minutes until the turkey is browned and onions are softened. Add the kidney beans, diced tomatoes, tomato sauce, chili powder, cumin, salt, and cayenne to the turkey mixture and stir together until well combined. Reduce the heat to low and simmer, uncovered, for about 5 minutes. Stir in the biscuit dough pieces and transfer the mixture to the prepared baking dish. Spread evenly and bake for 25 minutes. Remove from the oven and sprinkle the shredded cheese evenly across the top of the casserole. Return to the oven for another 15 minutes until hot and bubbly. Allow to cool for 5-10 minutes and cut into 6 servings. This looks yummy! Can it be made ahead? You can definitely make the chili mixture ahead of time, but I would wait until you’re ready to bake to add the biscuit pieces. Do you drain the diced tomatoes or just throw the whole can in? This looks so good! I can’t wait to make it. Thanks for sharing! Throw in the whole can! I made this but found I didn’t have tomato sauce, so I made a couple of adjustments. Used a can of Rotel instead of the tomato sauce, and a can of pinto beans (rinsed) instead of the kidney beans. It was delicious! My husband placed his serving over Fritos. That made his points much more, but it certainly wasn’t necessary. We loved the spicy flavor. How many servings does this make??? It looks soooo good. BRILLIANT! Best WW recipe EVER! 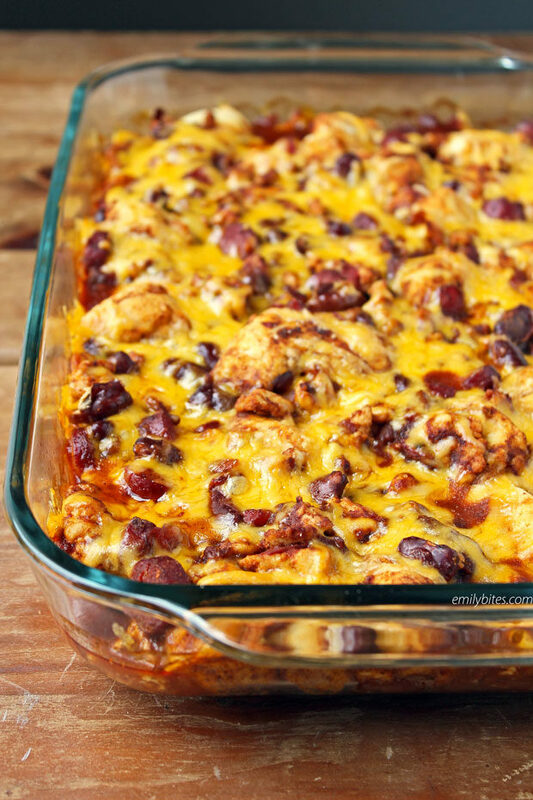 Loved this – may be my new favorite bubble up casserole. I topped it with my favorite hot dog toppings (mustard, ketchup and dill pickle relish). Truly a comfort food recipe! Very yummy! However, do the left overs freeze well? What if you left out the biscuits? How many points would it be? When I use the calculator on the WW app the recipe comes up as 8 points per serving. The original recipe says 5 WW Freestyle points. I’m curious as to why there’s a difference? Thanks! When it comes to 5 smartpoints per serving, would a serving be about a cup? I never really measure my casseroles that way, I always just cut them into the number of servings stated and serve from there. Sorry! Just put this in the oven. Thanks for sharing your recipe, I’m always looking for something that doesn’t make me feel like I’m dieting. Total comfort food, can’t wait to have it for dinner. has anyone tried this with a cornbread bottom? I wonder how that would be and what that would do with the points? This was delicious!!! My family Loved it. Perfect comfort food! This was very tasty. I really enjoyed this as it really felt like I was cheating. It was a nice filling portion size too. I made this tonight with my own version of chili and everyone loved it! I served mine with all the fixings of a hotdog.